ne of the greatest Americans that ever lived was Benjamin Franklin. The story of his life sounds like a fairy tale. Though he stood before queens and kings, dressed in velvet and laces, before he died, he was the son of a poor couple who had to work very hard to find food and clothes for their large family--for there were more than a dozen little Franklins! 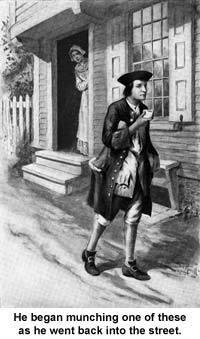 Benjamin Franklin was born in Boston, one bright Sunday morning more than two hundred years ago. That same afternoon his father took the baby boy across the street to the Old South Church, to be baptized. He was named for his uncle Benjamin, who lived in England. As Benjamin grew up, he made friends easily. People liked his eager face and merry ways. He was never quiet but darted about like a kitten. The questions he asked--and the mischief he got into! But the neighbors loved him. The women made little cakes for him, and the men were apt to toss him pennies. One day when Benjamin was about seven, some one gave him all the pennies he could squeeze into one hand. Off he ran to the toy shop, but on his way he overtook a boy blowing a whistle. Ben thought that whistle was the nicest thing he had ever seen and offered his handful of pennies for it. The boy took them, and Ben rushed home with his prize. Well, he tooted that whistle all over the house until the family wished there had never been a whistle in the world. Then an older brother told him he had paid the other boy altogether too much for it, and when Ben found that if he had waited and bought it at a store, he would have had some of the pennies left for something else, he burst out crying. He did not forget about this, either. When he was a grown man and was going to buy something, he would wait a little and say to himself: "Careful, now--don't pay too much for your whistle!" An Italian sculptor who had heard this story made a lovely statue called "Franklin and his Whistle." If you happen to be in the beautiful Public Library in Newark, New Jersey, you must ask to see it. But it was in school that Ben did his best. He studied so well that his father wanted to make a great scholar of him, but there was not money enough to do this, so when he was ten he had to go into his father's soap and candle shop to work. The more he worked over the candles, the worse he hated to, and by and by he said to his father: "Oh, let me go to sea!" "No," said Mr. Franklin, "your brother ran away to sea. I can't lose another boy that way. We will look up something else." So the father and son went round the city, day after day, visiting all kinds of work-shops to see what Benjamin fancied best. But when it proved that the trade of making knives and tools, which was what pleased Benjamin most, could not be learned until Mr. Franklin had paid one hundred dollars, that had to be given up, like the school. There was never any spare cash in the Franklin purse. As James Franklin, an older brother, had learned the printing business in England and had set up an office in Boston, Ben was put with him to learn the printer's trade. Poor Ben found him a hard man to work for. If it had not been for the books he found there to read and the friends who loaned him still more books, he could not have stayed six months. But Ben knew that since he had to leave school when he was only ten, the thing for him to do was to study by himself every minute he could get. He sat up half the nights studying. When he needed time to finish some book, he would eat fruit and drink a glass of water at noon, just to save a few extra minutes for studying. James never gave him a chance for anything but work; it seemed as if he could not pile enough on him. When he found Ben could write poetry pretty well, he made him write ballads and sell them on the streets, putting the money they brought into his own pocket. He was very mean to the younger brother, and when he began to strike Ben whenever he got into a rage, the boy left him. Benjamin went to New York but found no work there. He worked his way to Philadelphia. By this time his clothes were ragged. He had no suitcase or traveling bag and carried his extra stockings and shirts in his pockets. You can imagine how bulgy and slack he looked walking through the streets! He was hungry and stepped into a baker's for bread. He had only one silver dollar in the world. But he must eat, whether he found work or not. When he asked for ten cents' worth of bread, the baker gave him three large loaves. He began munching one of these as he went back into the street. As his pockets were filled with stockings and shirts, he had to carry the other two loaves under his arms. No wonder a girl standing in a doorway giggled as he passed by! Years afterwards, when Franklin was rich and famous, and had married this very girl, the two used to laugh well over the way he looked the first time she saw him. After one or two useless trips to England, Franklin settled down to the printing business in Philadelphia. He was the busiest man in town. Deborah, his wife, helped him, and he started a newspaper, a magazine, a bookstore; he made ink, he made paper, even made soap (work that he hated so when a boy!). Then he published every year an almanac. Into this odd book, which people hurried to buy, he put some wise sayings, which I am sure you must have heard many times. Such as: "Haste makes waste"; "Well done is better than well said"; and "Early to bed and early to rise, makes a man healthy, wealthy, and wise." Franklin and his wife did so many things and did them well that they grew rich. So when he was only forty-two, Franklin shut up all his shops and took his time for studying out inventions. When you hear about the different things he invented, you will not wonder that the colleges in the country thought he ought to be honored with a degree and made him Doctor Franklin. Here are some of his inventions: lightning-rods, stoves, fans to cool hot rooms, a cure for smoking chimneys, better printing-presses, sidewalks, street cleaning. He opened salt mines and drained swamps so that they were made into good land. Then he founded the first public library, the first police service, and the first fire company. Doesn't it seem as if he thought of everything? "Very well, then," said the council, "then you colonists can't have any more clothes from England." Mr. Franklin answered back: "Very well, then, we will wear old clothes till we can make our own new ones!" In a week or so word was sent from England that clothing would not be taxed, and the colonists had great rejoicings. They built bonfires, rang bells, and had processions; and Benjamin Franklin's name was loudly cheered. But England still needed money and decided to make the colonists pay a tax on tea and a few other things. Then the American colonists were as angry as they could be. They tipped the whole cargo of tea into Boston Harbor, and in spite of Franklin's trying to make the king and the colonists understand each other, there was a long war (it is called the Revolutionary War) and it ended in the colonists declaring themselves independent of Great Britain. A paper telling the king and the world that the colonists should not obey the English rule any longer, but would make laws of their own was signed by men from all thirteen colonies. Benjamin Franklin was one of the men from Pennsylvania who signed it. As this paper--The Declaration of Independence--was first proclaimed July 4, 1776, the people always celebrate the fourth day of July throughout the United States. Franklin was admired in France and England for his good judgment and clever ideas. Pictures of him were shown in public places; prints of his face were for sale in three countries; medallions of his head were set in rings and snuff-boxes; he traveled in royal coaches, and was treated like a prince. But although it was "the Great Doctor Franklin" here, and "the Noble Patriot" there, he did not grow vain. Benjamin Franklin was just a modest, good American!